Well we certainly hit paydirt when we walked past this eatery located in Braidwoood and decided to ask about the dinner menu. Sitting out the front in the morning enjoying a coffee was Chef Zac, we enquired about the menu and was advised that as it is Saturday fish will be on the menu along with a pork dish. Two entrees, two mains and by the time we arrive for dinner he will have worked out how the dishes with a Thai Asian fusion flavour will have come together. 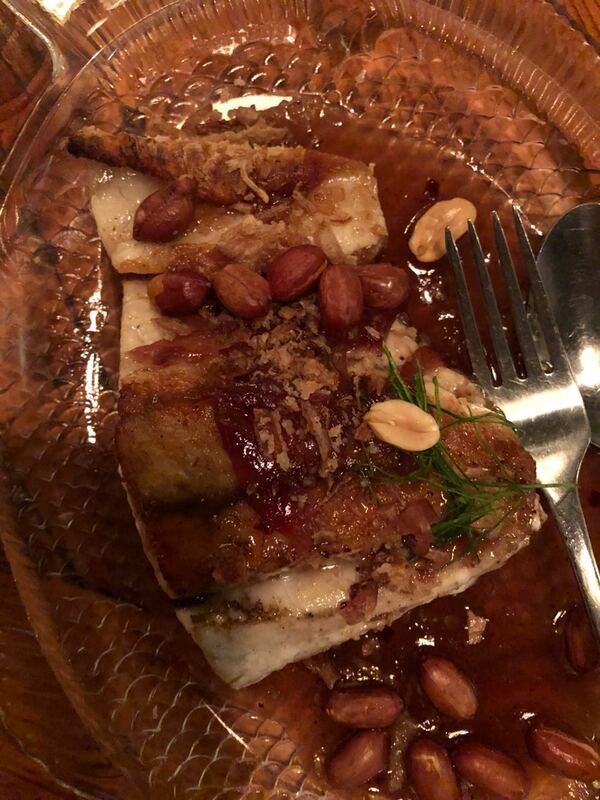 Paydirt is located in the Main Street, it is a small shopfront with a kitchen out the back where Chef works hard preparing our dinner, we sat at the long communal table chatting with other diners and felt like we were in Zac’s living room. The waiter recommended we share the dishes wo we chose both entree’s, both mains and a vegetable massaman curry between the four of us. The massaman was not on the menu but was kindly offered when they picked up that we had a vegetarian with us. We started with the steamed pork, ginger & mushroom dumplings drizzled with a sesame chilli oil, a lovely balance of flavour. Our second entree was a seared salmon fillet w wasabi mayonnaise & pickled papaya. 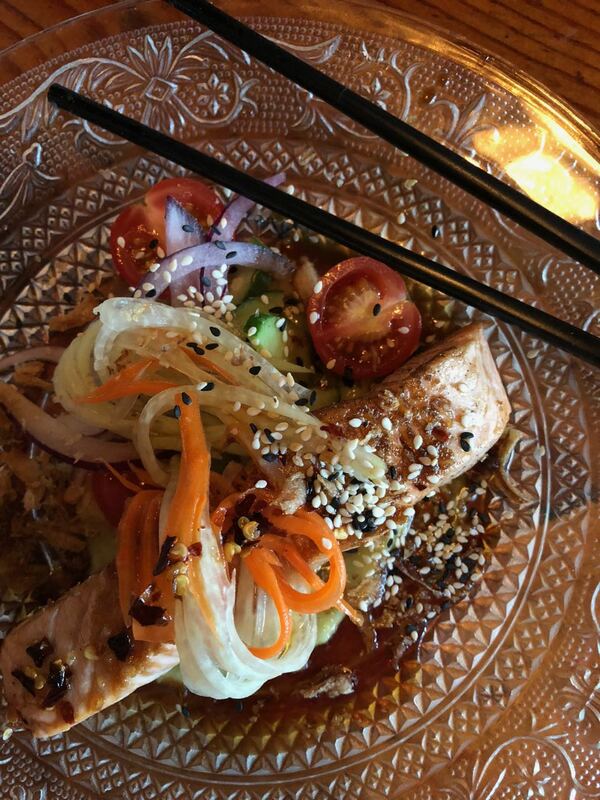 The wasabi was not overpowering and the pickles cut through the richness of the salmon. Our first main was the pork spare rib in a tasty broth with green beans, daikon & pickled cabbage. The dish was well balanced, light and refreshing. The curry paste for the massaman was obviously house made with care and studded with roasted peanuts. Delicious and nutty, none of the store bought stuff here - the carnivores were envious! We finished off with the pan fried barramundi in a tamarind sauce, scraping up every last drop of the sauce to drizzle on our steamed rice. It was a pleasure to walk home in the cool evening air after a great dinner to our comfortable digs for a cup of tea and chocolate covered honeycomb.